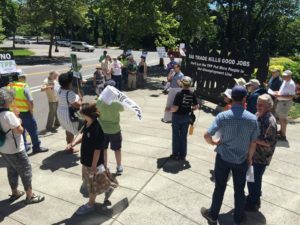 ← Bad Trade Kills Good Jobs rallies in Oregon! 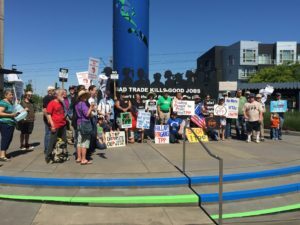 Portland & Beaverton, Oregon — Labor and community advocates held rallies and press events in Beaverton and Portland this week to discuss the release of a new government study that finds Oregon jobs in manufacturing, agriculture, forest products and the service sector are at risk under the proposed Trans-Pacific Partnership (TPP) trade agreement. 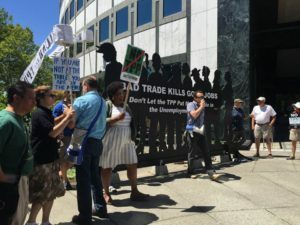 In front of a giant prop representing an unemployment line, they called on area Congress members Suzanne Bonamici (D-01) and Earl Blumeanuer (D-02) to oppose the TPP. More than 99% of Oregon’s manufacturing workers are in sectors of the economy projected to experience worsening trade deficits under the TPP. 95,269 Oregonians work in manufacturing sectors expected to lose under the agreement, while only 514 Oregonians work in the one manufacturing sector expected to see gains (petroleum and coal). Oregon’s top agricultural export, wheat, is expected to suffer decreased exports under the TPP, as is the forest products sector. 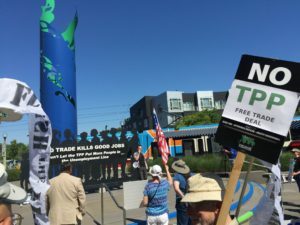 What’s more, most of what U.S. service-sector benefits are projected for the TPP aren’t from U.S.-based employees providing services cross-border, but rather from sales by U.S. companies’ foreign-owned affiliates, meaning profits for transnational corporations, but fewer jobs for Oregon workers. The TPP was signed in February, but has not yet been submitted to Congress for a vote. It is widely expected to be considered by Congress later this year. Leading presidential candidates Hillary Clinton, Bernie Sanders and Donald Trump have all criticized the TPP as bad for American jobs, and have said it should not be approved by Congress. Representatives Bonamici and Blumenauer, however, have said they are undecided on the TPP. The ITC report’s unexpected findings included that the TPP would provide almost no gains for U.S. economic growth (only 0.15 percent by 2032) while reducing employment in manufacturing, shrinking the U.S. service sector trade surplus and increasing the overall U.S. trade deficit. Because the agency employs a model that incorporates unrealistic assumptions, such as constant full employment and no currency manipulation, past projections have systematically overstated the benefits of trade pacts relative to their outcomes. The ITC projected much more optimistic outcomes for the most recent previous U.S. trade agreement on which TPP was modeled, the 2012 U.S-Korea Free Trade Agreement. 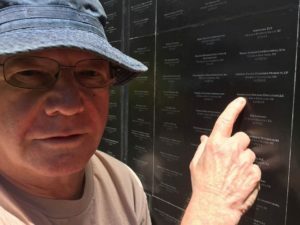 But in reality, the U.S. trade deficit with Korea in the top 10 products that Oregon exports to Korea – including everything from machinery to agricultural products – ballooned 98 percent in the agreement’s first four years. The overall U.S. goods trade deficit with Korea surged $15.4 billion (99 percent). According to the administration’s trade-jobs ratio, that equates to the loss of over 102,554 U.S. jobs in four years of the FTA. The TPP dwarfs the size of the Korea trade agreement, covering approximately 40% of the global economy. This week’s press conferences were held in front of a 8’ by 16’ silhouette of an unemployment line emblazoned with the names of approximately 10,000 recent trade-related plant closures and downsizings.